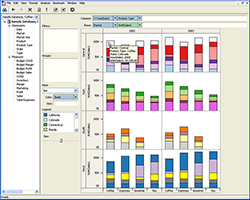 The very first release, built on the revolutionary technology that makes Tableau what it is today. 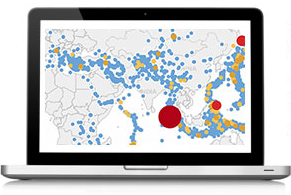 Tableau Desktop is built on the idea that you can work with data by using pictures, not just numbers and code. Use your mouse and a few clicks to drag and drop and analyze your data. Tableau is built on years of research to build a system that supports people's natural ability to think visually. Every change you make is shown in pictures you can instantly understand. This includes building charts, swapping axes, filtering information, and much more. Welcome to business analytics anyone can learn and use. Tableau's breakthrough technology, called VizQL, allows you to visualize your data without needing to even touch your keyboard. 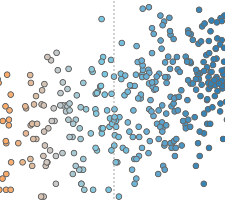 As you use your mouse to drag and drop to create charts, Tableau translates your actions into database queries and then expresses the response graphically. Shift fluidly between views, following your natural train of thought. No wizards, code, or other intermediate scripts. You maintain a constant view of your data without having to lift a finger off your mouse. Tableau was built on these three principles. Anyone should be able to work with their data and derive usable insights out of their data. It should also work fast, as fast as you can think--all the while outputting beautiful graphics that humans intuitively understand. Finally, this tool should be usable anywhere, and with any kind of data you have. This first release of Tableau Desktop was a giant first step towards fulfilling these principles. You can perform powerful database queries without knowing how to write them. The results are visual graphics, not code. And you can connect to spreadsheets, databases and cubes. But it's a first step. As you look through our subsequent releases, you'll see each one brings us closer and closer to making those principles even more of a reality, and ultimately towards accomplishing our mission: to help people see and understand their data.